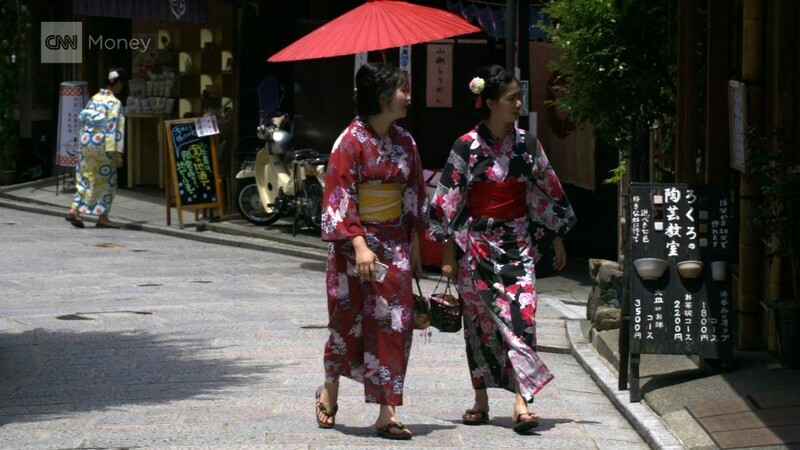 Millions of Japanese people are in danger of working themselves into an early grave. Known for the punishing hours demanded by its 'salaryman' culture, Japan has struggled to tackle the impact of overwork on employees' health. But plans to overhaul labor laws could improve the situation. 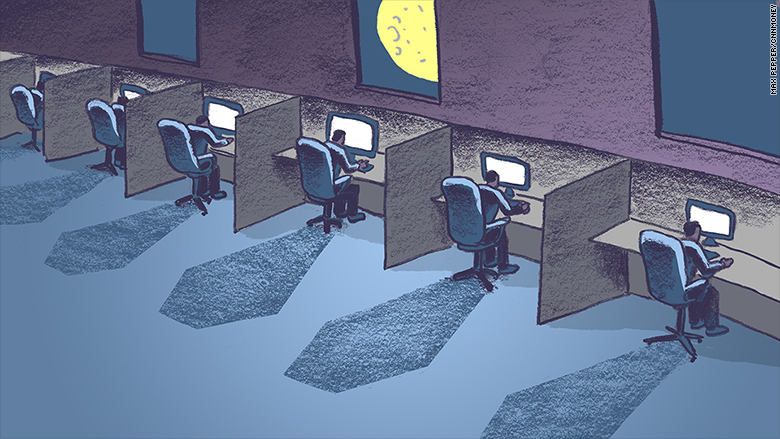 A recent government study found that one in five workers are at risk of working themselves to death. It's such a big problem that Japan even has its own word for it: karoshi (death by overwork). Calls for tougher measures to deal with the issue intensified recently following the death of a 24-year-old employee at Dentsu, a major advertising agency. Matsuri Takahashi jumped to her death from a company dormitory in late December 2015. Last month, Tokyo officials recognized her suicide as the result of karoshi, which is defined as employees working so hard that they die from stress-related disease -- or become so depressed that they kill themselves. 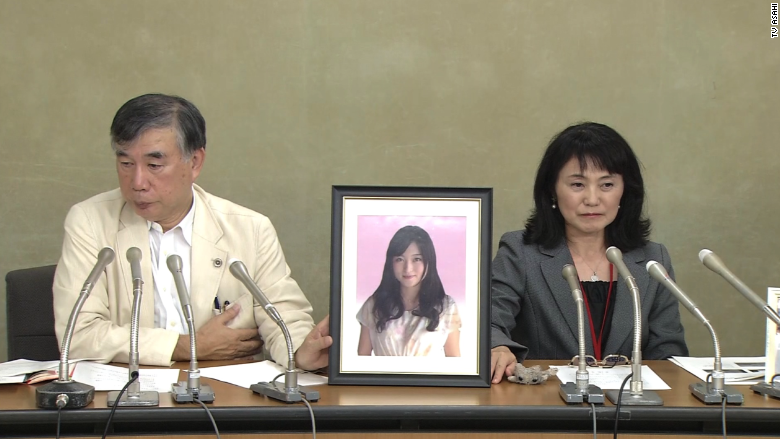 The parents of Matsuri Takahashi, whose suicide was attributed to overwork, spoke at a news conference in October. "Ms. Takashi's death was caused by serious depression triggered by overwork and harassment," Hiroshi Kawahito, a lawyer representing her case, told CNNMoney. According to authorities, Takashi had clocked around 105 hours of overtime in the month leading up to her suicide. The term karoshi was first coined in the 1970s during Japan's postwar era of rapid economic growth. "Doctors were beginning to see a number of employees who seemed healthy otherwise simply dropping dead," said Scott North, a sociology professor at Osaka University. "They put their knowledge of cardiovascular diseases together with the situation they were seeing to infer that it was overwork that was killing these people." Since the 1980s, labor lawyers and citizens groups have been pushing for changes to the law to recognize karoshi as a serious social issue. Their efforts resulted in a 2014 law that called for better working conditions but didn't force companies to actually do anything, according to experts. "Japan Inc has been in denial about karoshi because it is considered normal that your employees work excessive hours," said Jeff Kingston, director of Asian Studies at Temple University in Tokyo. Now there are signs that things are beginning to change. Takahashi's high-profile case and the recent recognition of a 27-year-old Filipino trainee's death in 2014 as karoshi have spurred a shift in attitudes, according to Kawahito, who is also the secretary general of the National Defense Counsel for Victims of Karoshi. After an inspection by government officials, Dentsu, the advertising agency where Takahashi worked, announced it would reduce overtime to a maximum of 65 hours per month. Prime Minister Shinzo Abe met with workers to discuss plans to revise labor laws to limit the demands on employees. A spokesman for the Ministry of Health, Labor and Welfare said the government would publish its proposals by March 2017. Kawahito, who has been representing karoshi cases since the late 1980s, said he hoped parliament would legislate soon. "The public is putting more pressure on the Japanese government and companies to deal with karoshi," he said. Experts say any new legislation needs to be strong enough to compel businesses to act. North called for penalties like heavy fines for companies that break the rules. Koji Morioka, a professor at Kansai University who has studied karoshi, said strict limits have to be set on how much employees can safely work. Japan's top business federation, Keindanren, called this month for firms to stop overworking their staff. But its words failed to satisfy some observers. "It is belated damage control to call on members to refrain from doing what everyone has knowingly done for decades," Kingston said. "It has taken a young woman's suicide and a series of legal developments to finally push Keidanren to do what it should have done long ago."